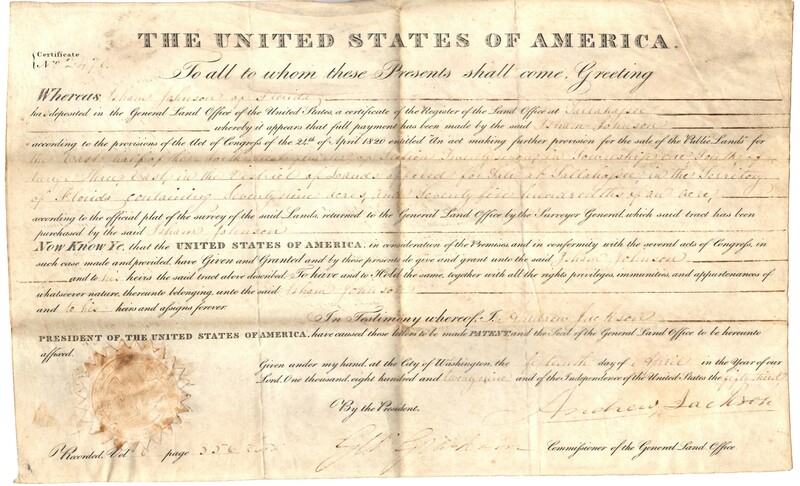 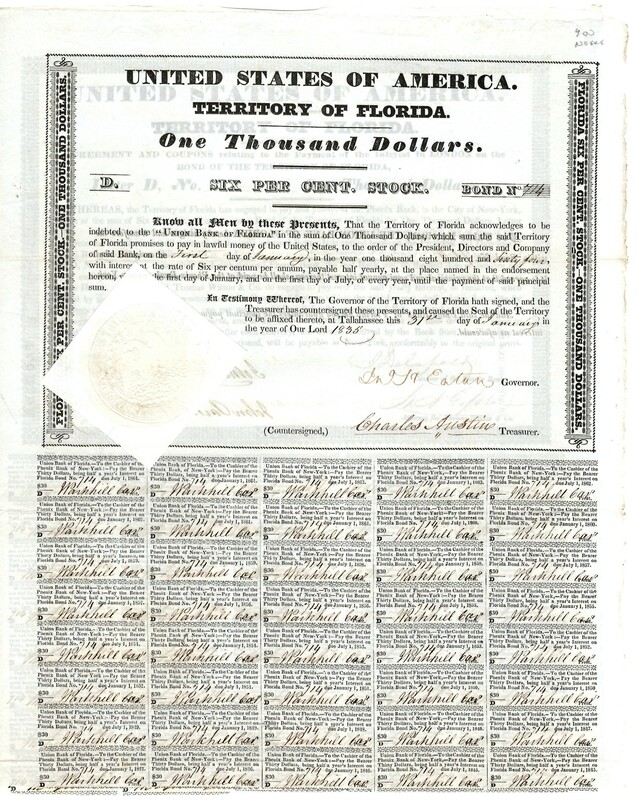 1829 USA Land Grant of Sale of 75 3/4 acres of land to Isham Johnson, Certificate No. 2470, Territory of Florida, Signed by President Andrew Jackson. On July 17,1821, Spain transferred Florida to the United States. President James Monroe appointed Andrew Jackson as Commissioner of the U.S. to take possession of FLorida and gave him the full powers of governor, March 10, 1821. 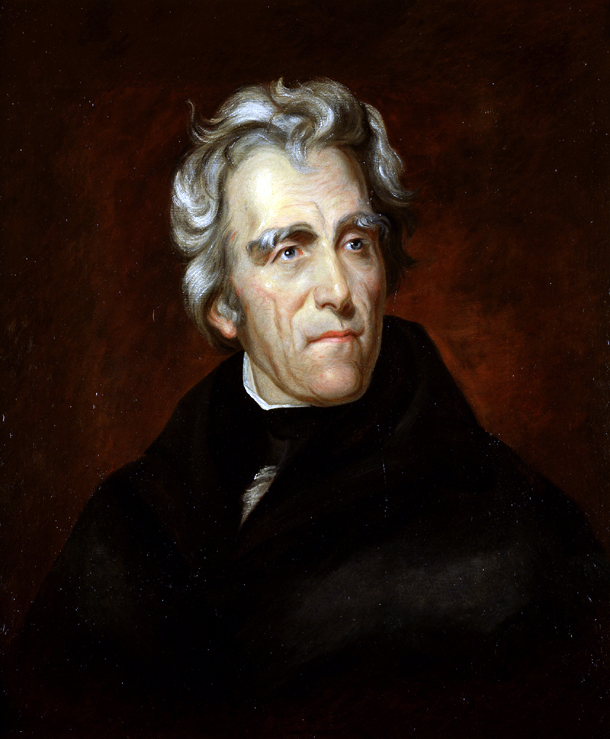 Interesting is the fact that Jackson who was born in 1767 would live to see Florida become a state in 1845, he died the same year. 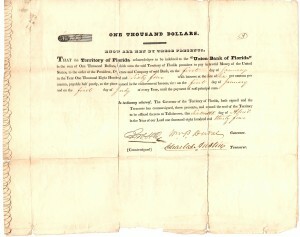 1834 $1000 Bond Signed by Governor William Pope Duval. 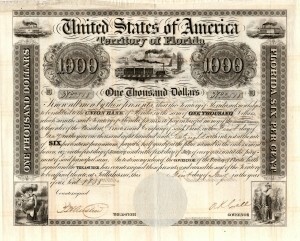 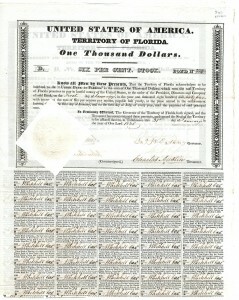 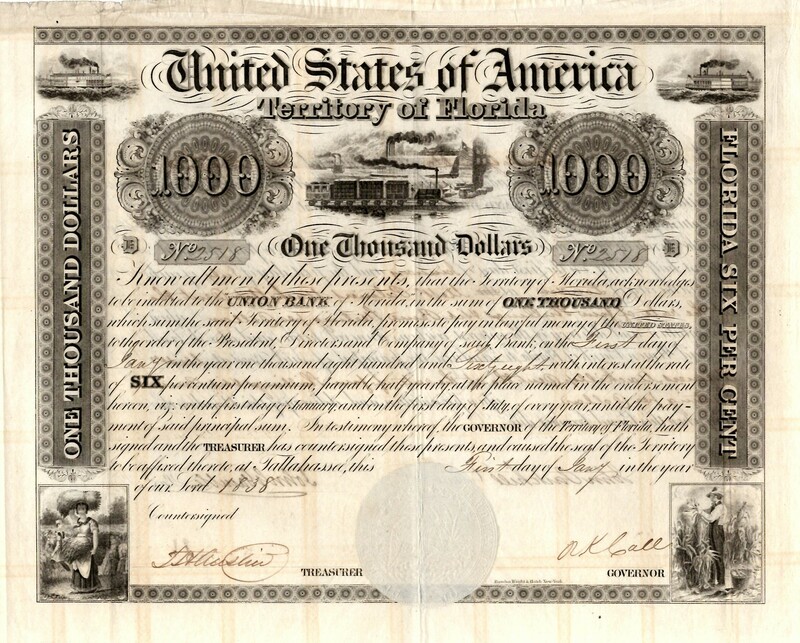 1835 Territory of Florida $1000 Union Bank of Florida Bond, signed by Governor John Eaton. 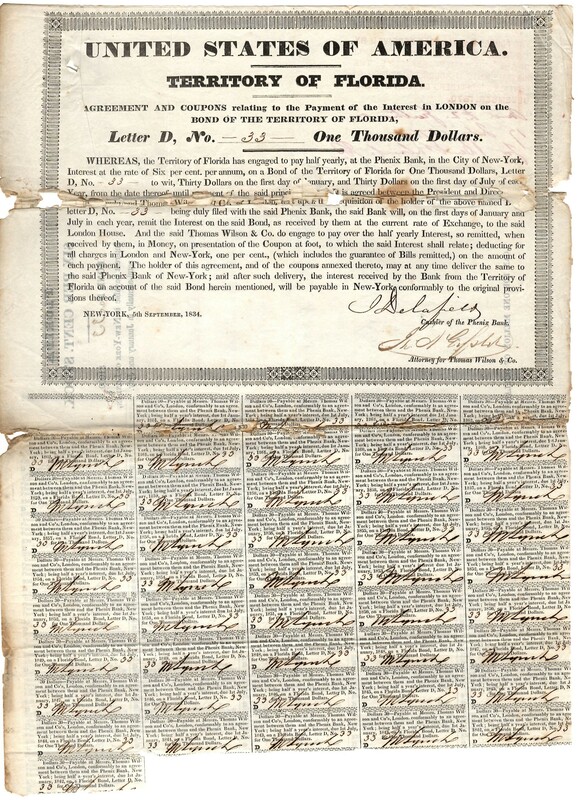 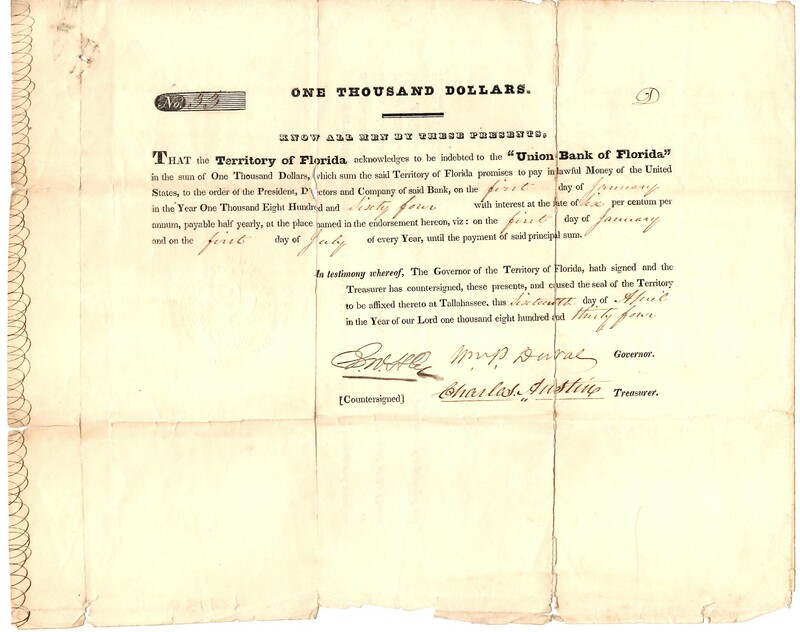 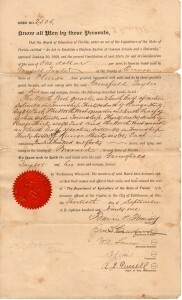 1838 Territiory of Florida $1000 Bond signed by Governor Richard K. Call. 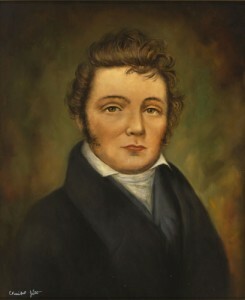 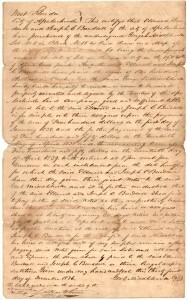 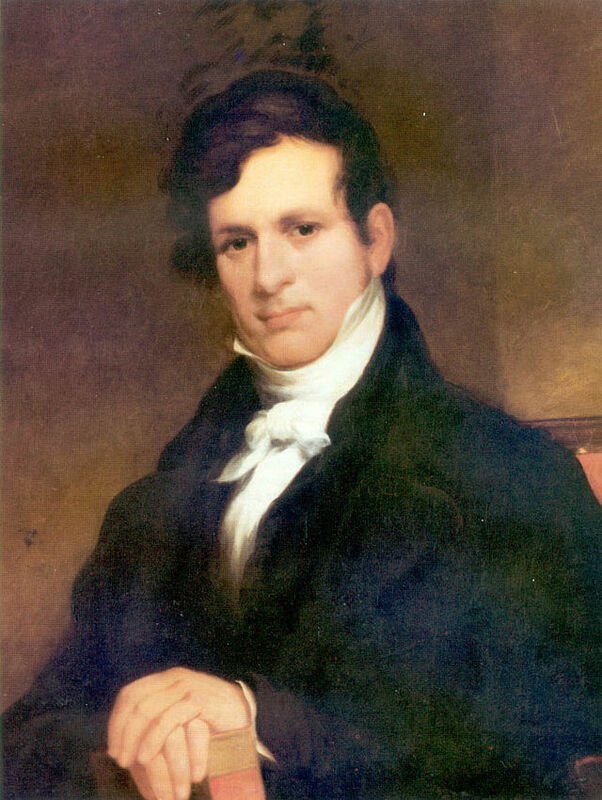 1819 signed letter by Robert Raymond Reid, who later became Governor in December of 1839. 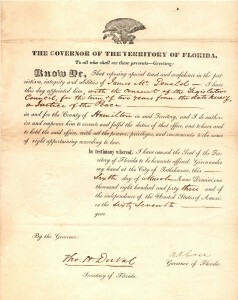 Letter dated March 6, 1843 appointing James McDonald as Justice of the Peace for Hamilton County, Territory of Florida, signed by Governor A.K. 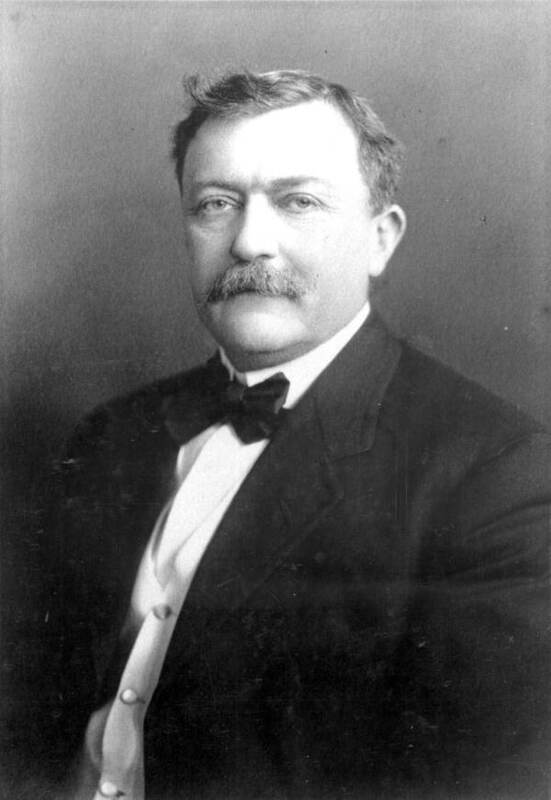 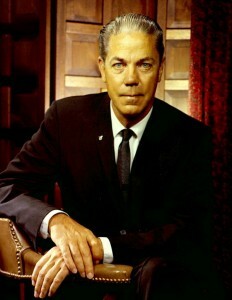 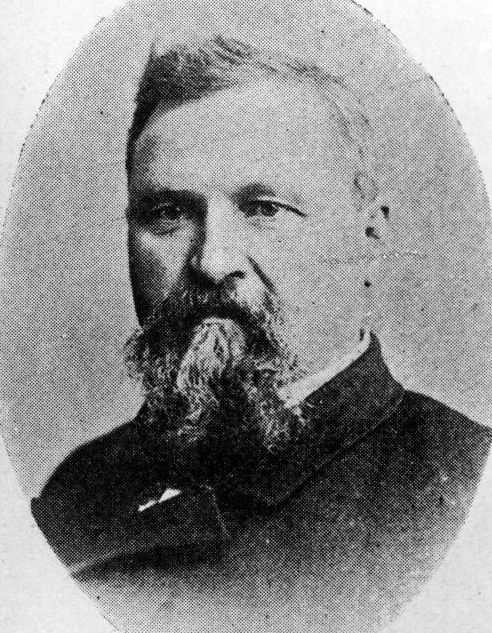 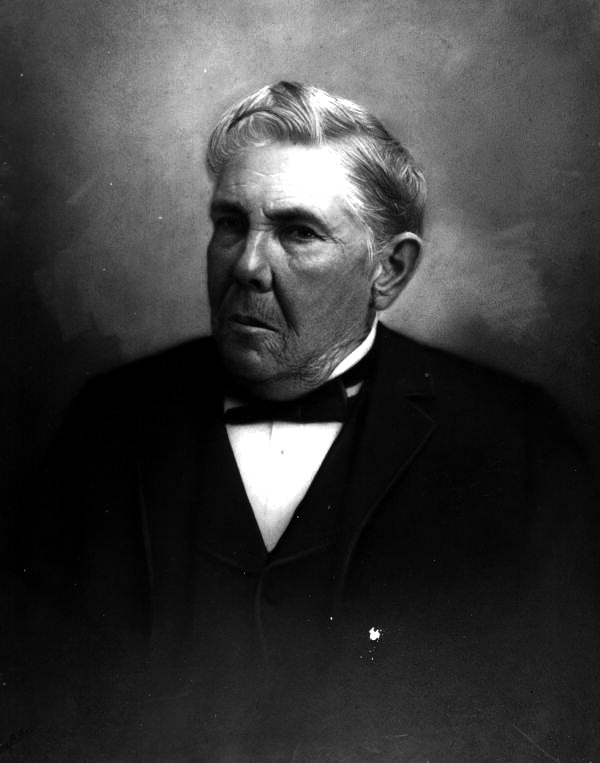 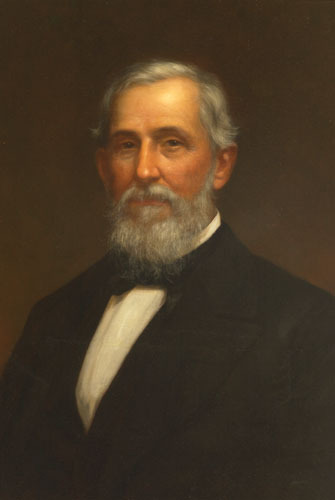 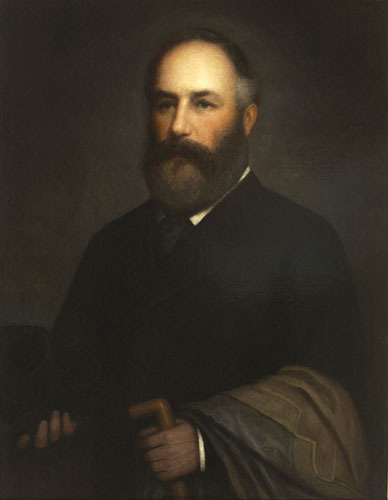 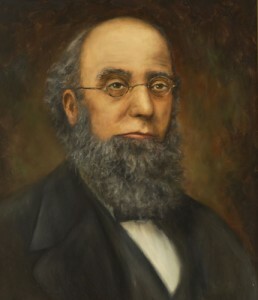 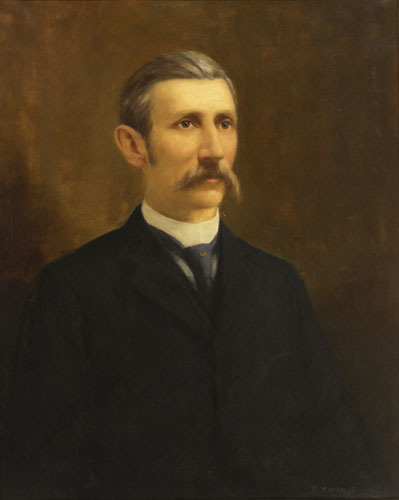 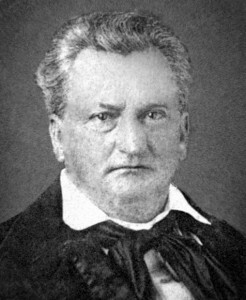 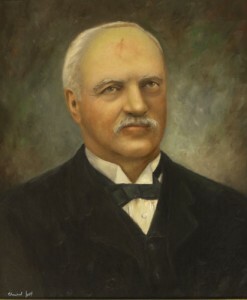 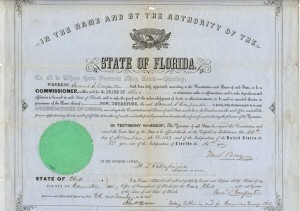 Call and Thomas H. Duval, Secretary of Territory of Florida. 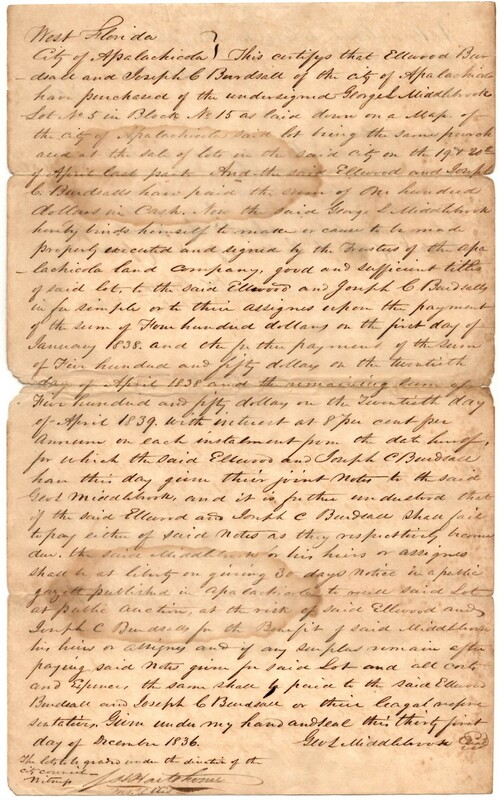 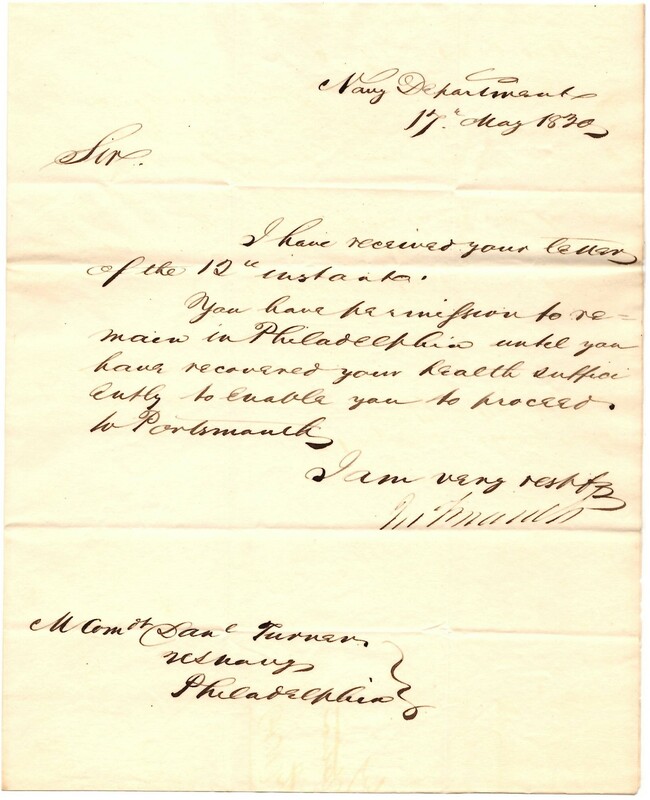 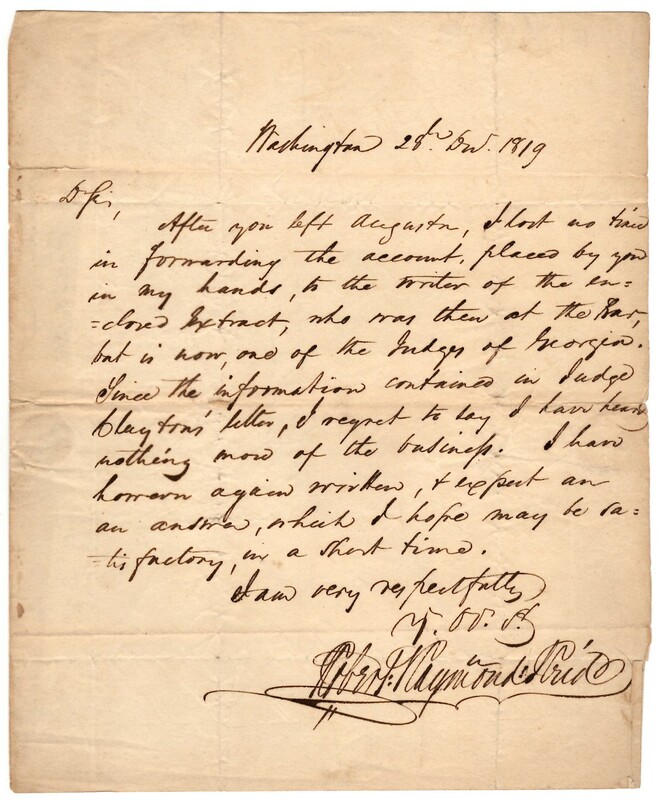 May 17, 1830 letter addressed to the Navy Department Philadelphia, signed by John Branch who became Territorial Governor of Florida in August of 1844. 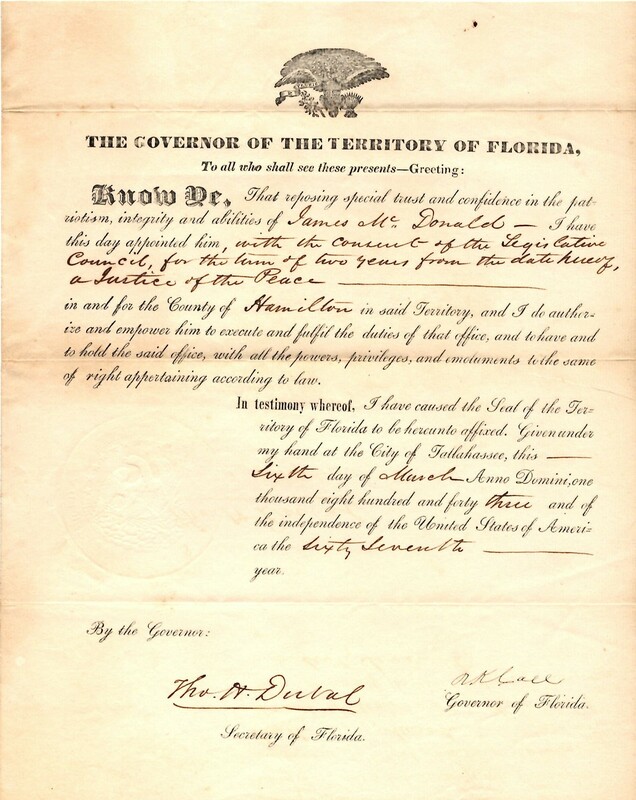 Appointment notice by State of Florida Governor William Dunn Moseley on May 29, 1849, Lewis H. Bryan Secretary of State A.E. Maxwell. 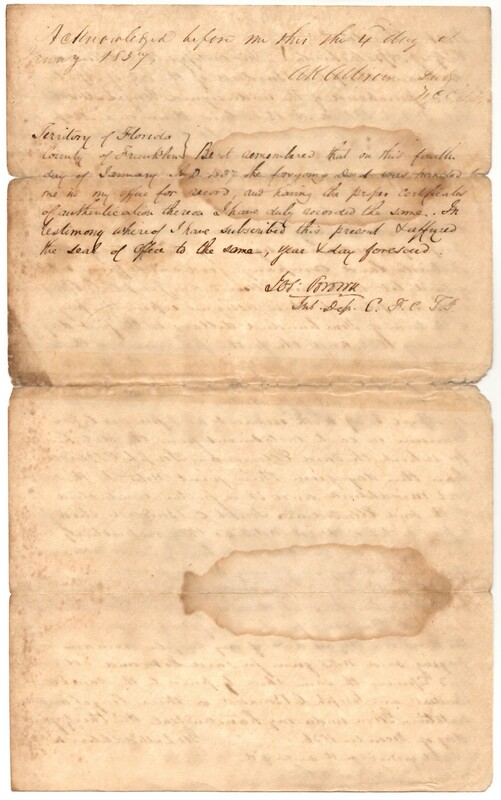 War Department Letter dated March 16, 1853 signed by and issued from Secretary of War, Jefferson Davis and the Governor of Florida, Thomas Brown. 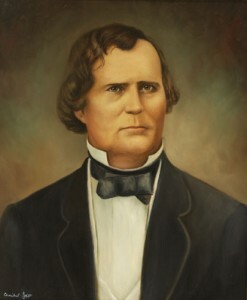 Jefferson Davis (1808-1889) was the first and only president of the Confederate States of America. 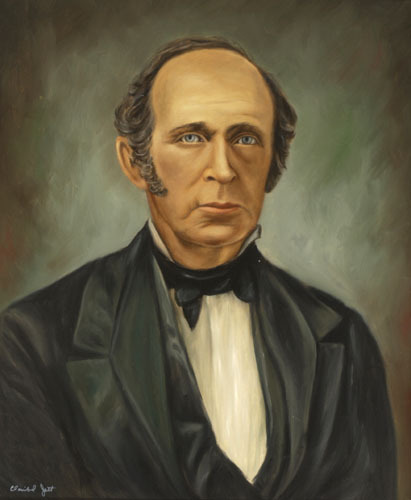 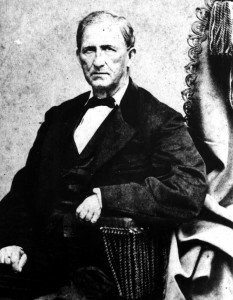 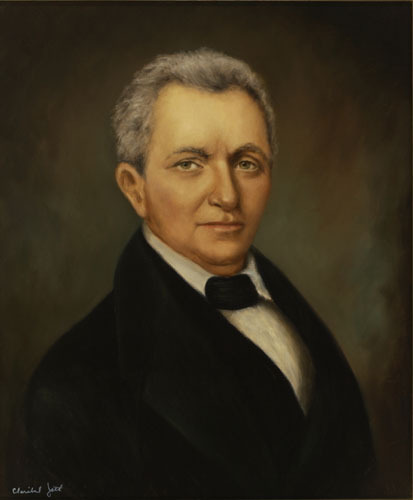 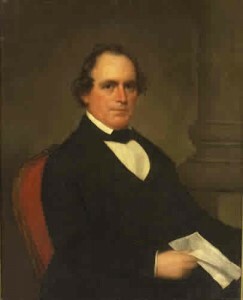 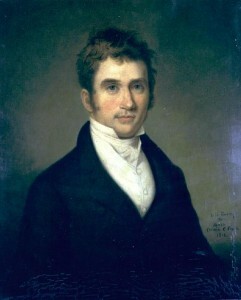 After a distinguished career in national politics as Secretary of War under Franklin Pierce, Davis served as a congressman and then as a Mississippi senator. After the South’s defeat in the Civil War, he was stripped of his citizenship and took refuge in Europe, returning to the United States after a treason case against him was dropped. 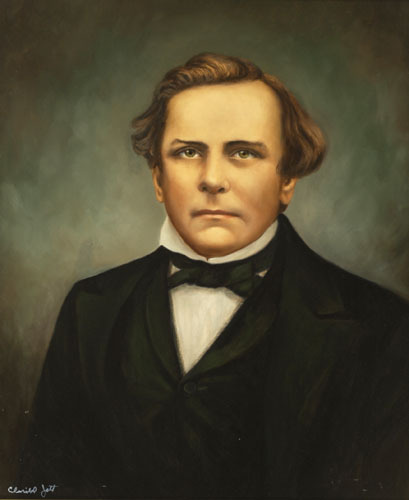 He died in New Orleans in 1889, and Congress posthumously reinstated his American citizenship in 1978. Davis is buried in Richmond, Virginia, once the capital of the Confederacy. 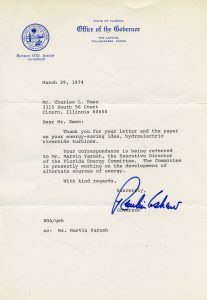 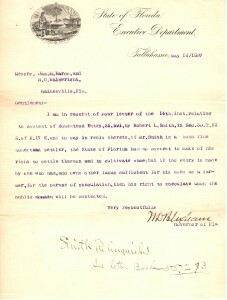 Appointment letter of E.C. 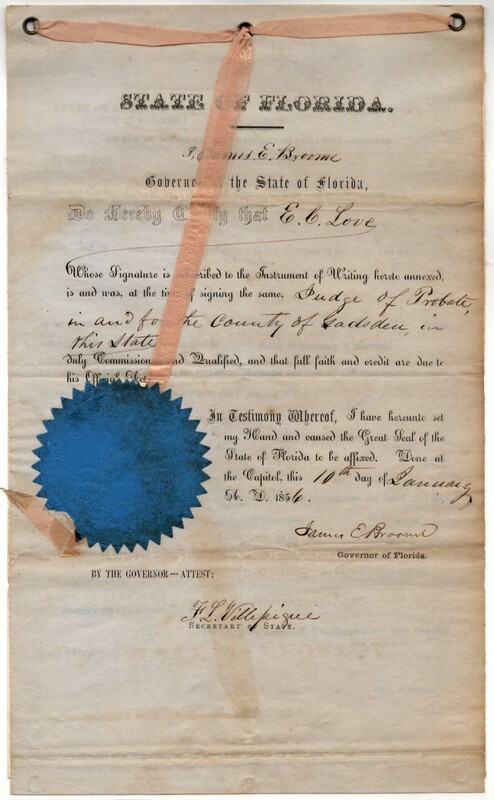 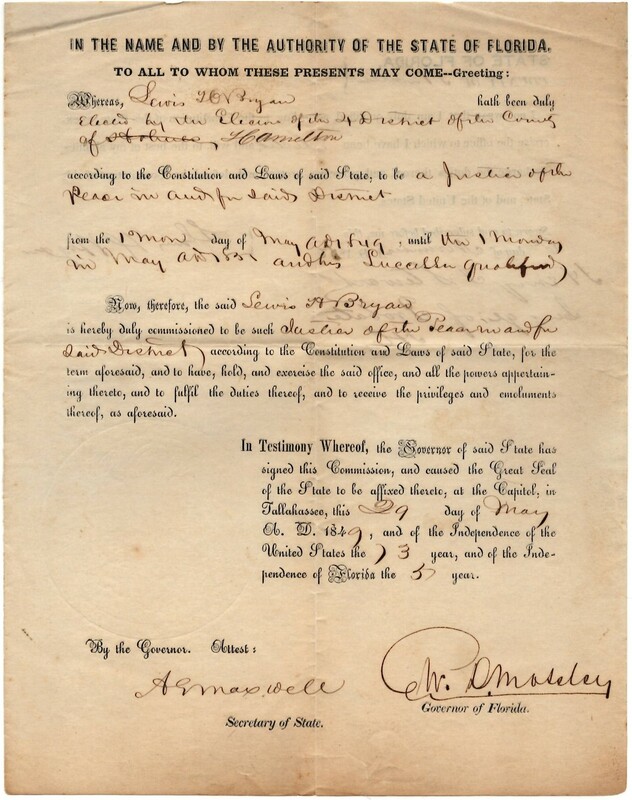 Love as judge of Probate for the county of Goodsen, Florida dated January 10, 1856 and signed by Governor James E. Broome as well as Secretary of the State of Florida, Villepique. 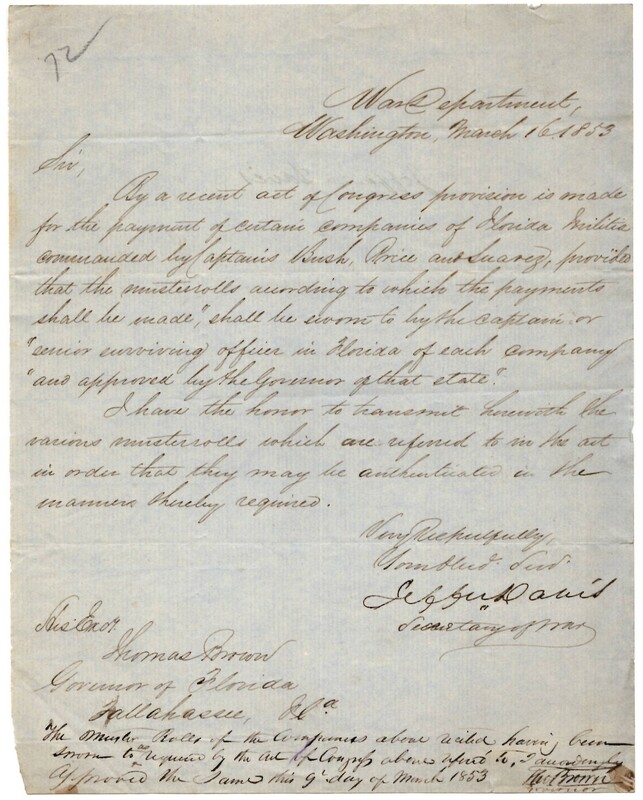 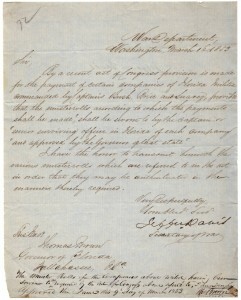 November 30, 1858 appointment letter for Samuel S. Carpenter as Commissioner of Deeds signed by Governor Madison S. Perry. 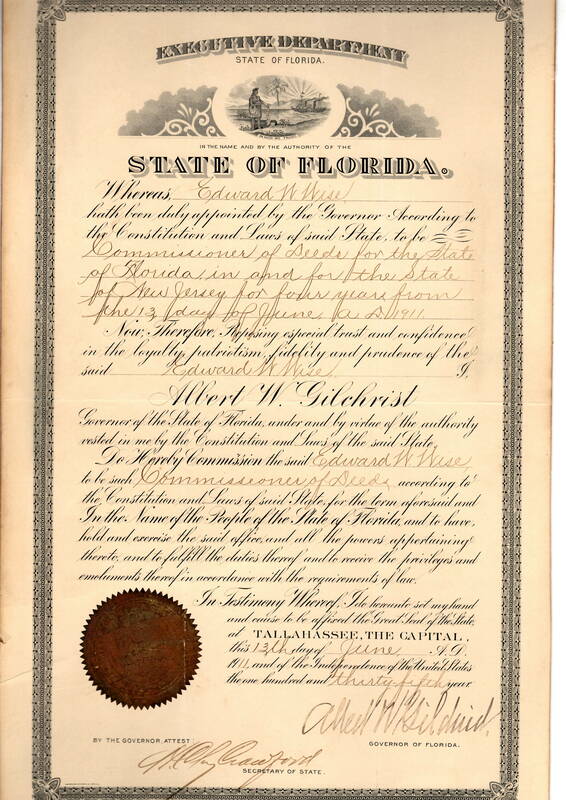 Confederate State of America, War Department, signed by Governor John Milton, January 11, 1862. 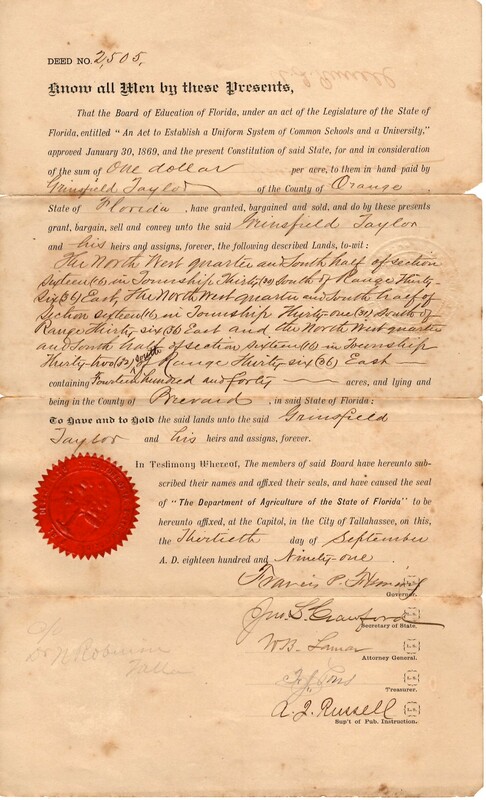 December 31, 1836 Sale of Land Deed in Apalachicola and “acknowledged before me this 4th day of January 1837” signed by Abraham K. Allison. 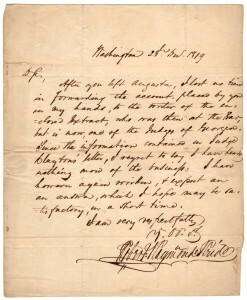 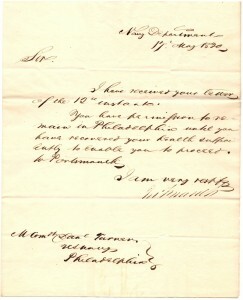 Appointment letter for Henry P. Stewart to Duty of Judges Hamilton, signed by David S. Walker. 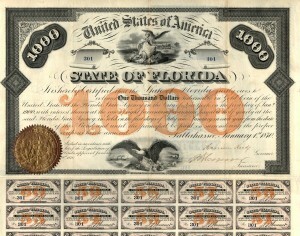 January 1, 1870 $1000 Bond signed by Governor Harrison Reed. 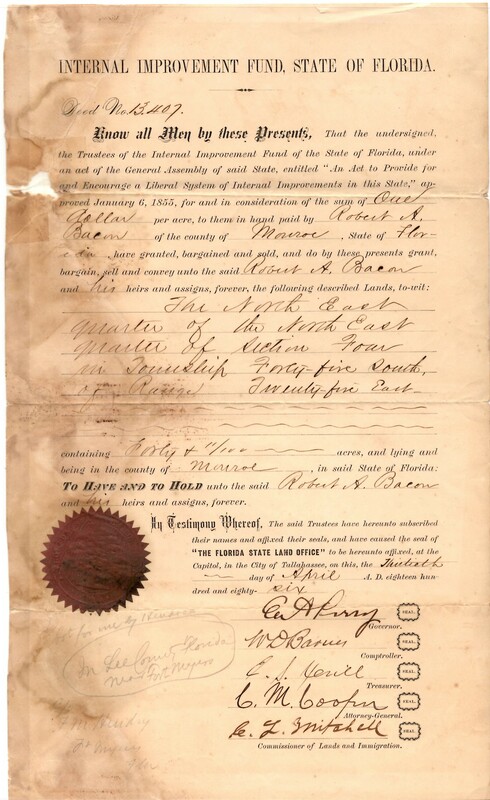 Appointment letter for a Notary Public for the state, signed by Governor Marcellus Stearns. 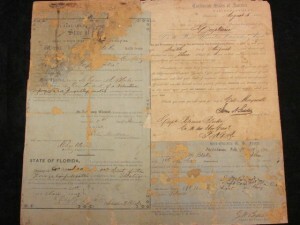 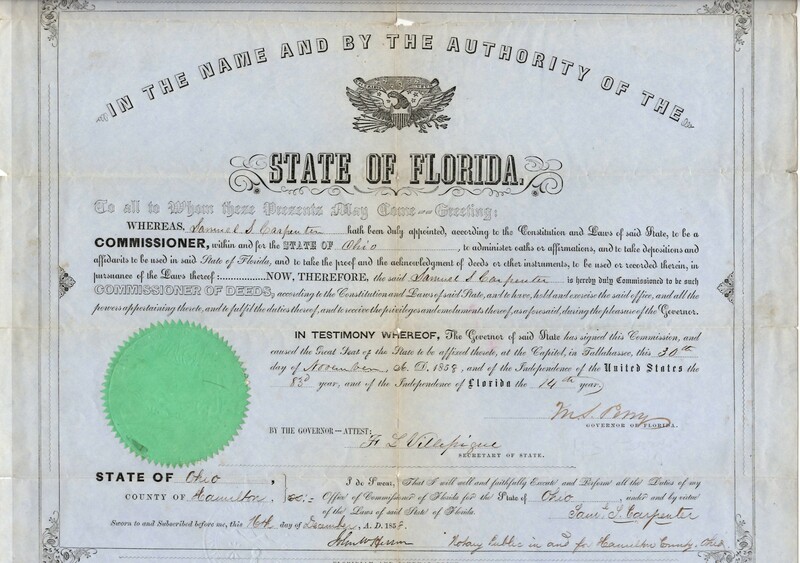 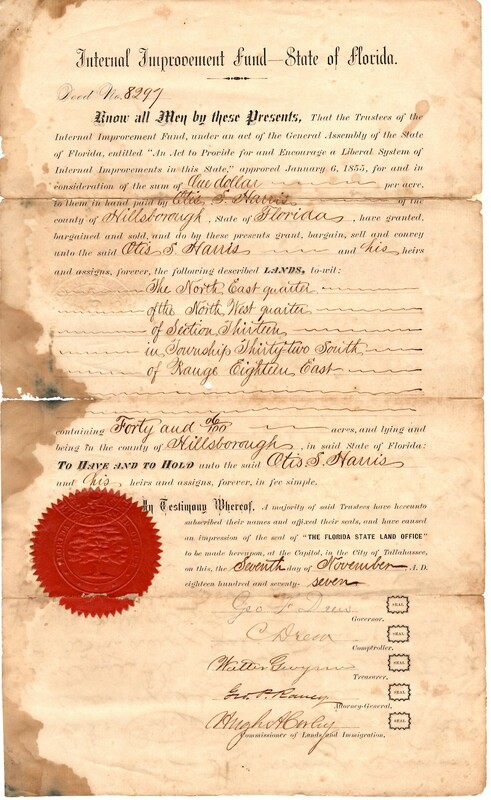 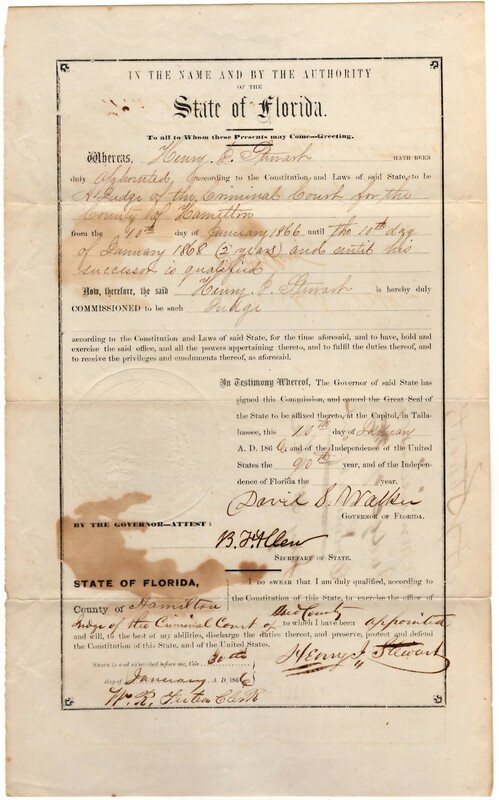 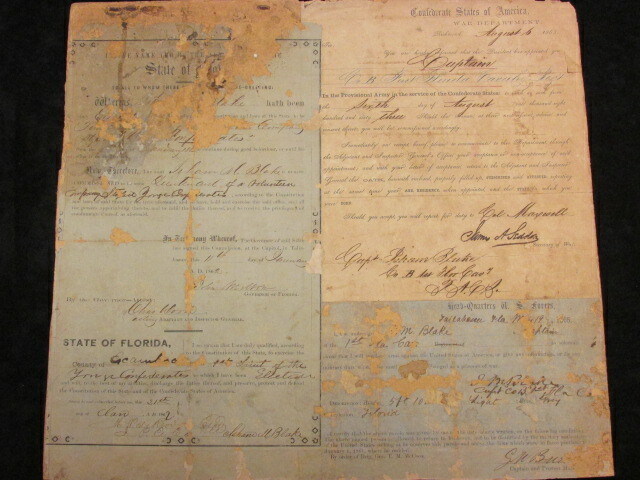 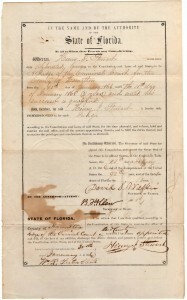 November 7, 1877 Florida State Land Office Deed No. 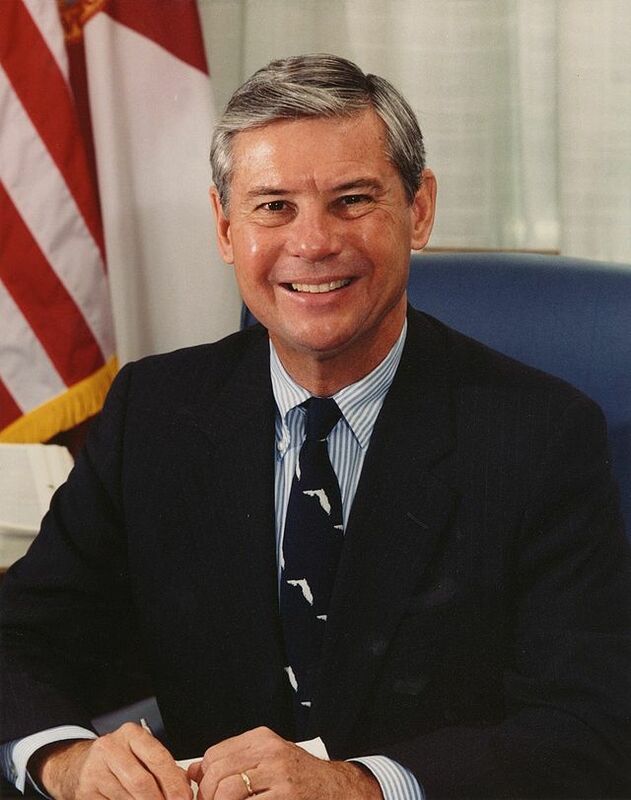 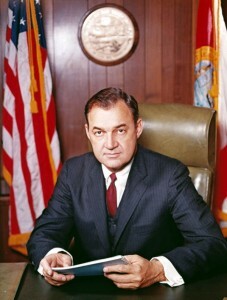 8297 “Internal Improvement Fund” signed by Governor George F. Drew. 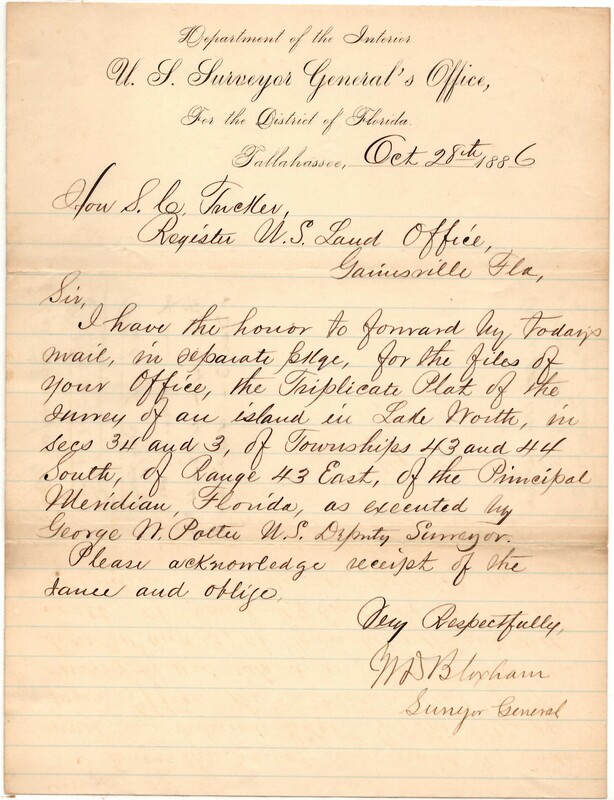 U.S. Surveyor General’s Office letter, dated October 28, 1886 signed by ex-governor William D. Bloxham as Surveyor General. 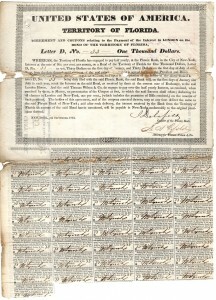 Internal Improvement Fund, Deed No. 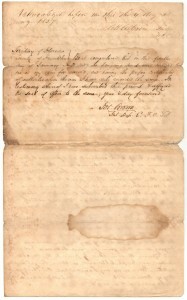 13407, signed by Governor Edward A. Perry. 1887-1889 Signed State of Florida Seal by Governor E.A. 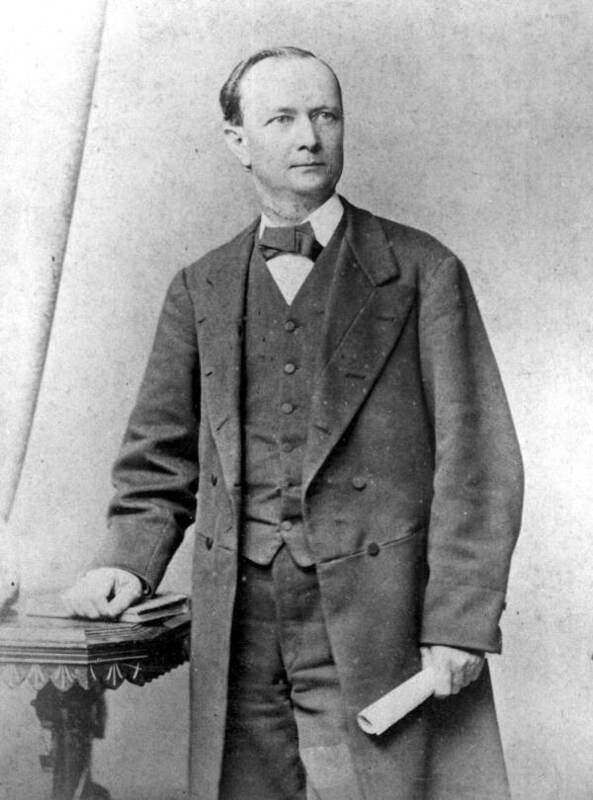 Perry, Private Secretary L.B. 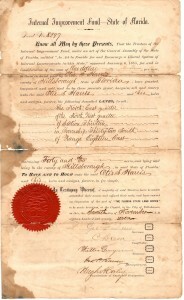 Wombwell, and Secretary of State Jno. L. Crawford. Board of Education Deed No. 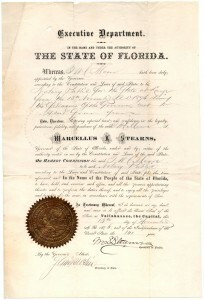 2505 signed by Governor Francis P. Flemming. 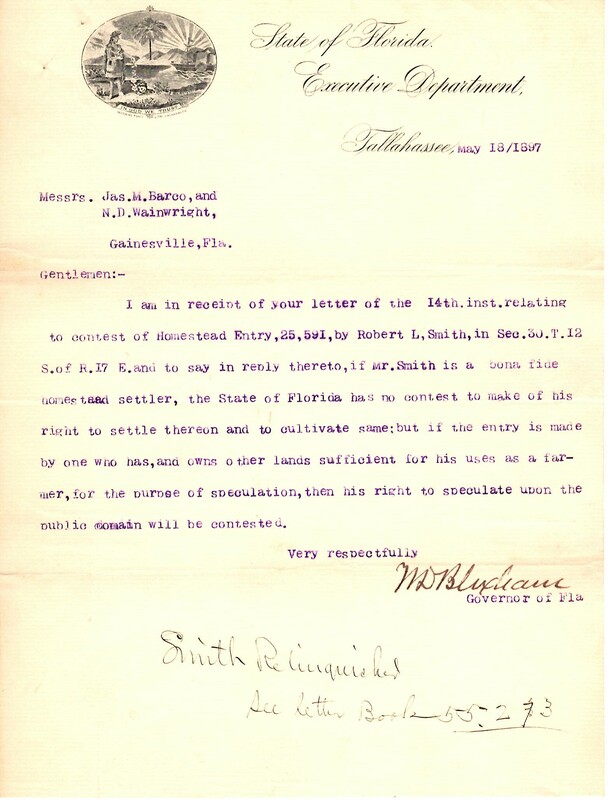 June 4, 1895 appointment letter appointing H.W. Fuller as County Commissioner from district no. 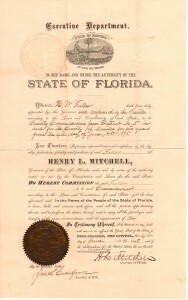 5 signed by Governor Henry L. Mitchell. 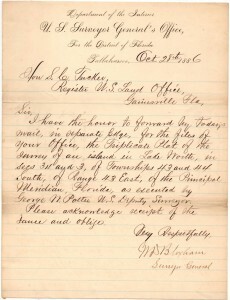 May 8, 1897 Letter from “State of Florida Executive Department” signed by Governor William D. Bloxham. 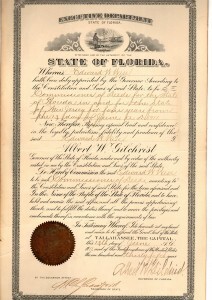 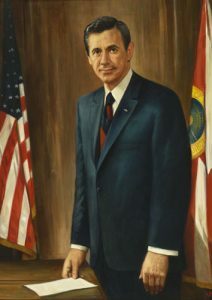 June 13, 1911 Executive Department State of Florida naming Edward W. Wise as Commissioner of Deeds. 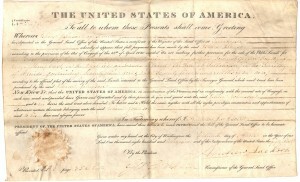 Signed by Governor Gilchrist and Secretary of State, Henry Clay Crawford. 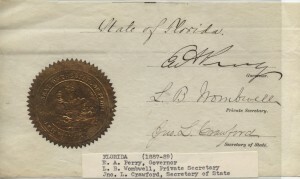 State of Florida Seal signed by Governor W. Hayden Burns. 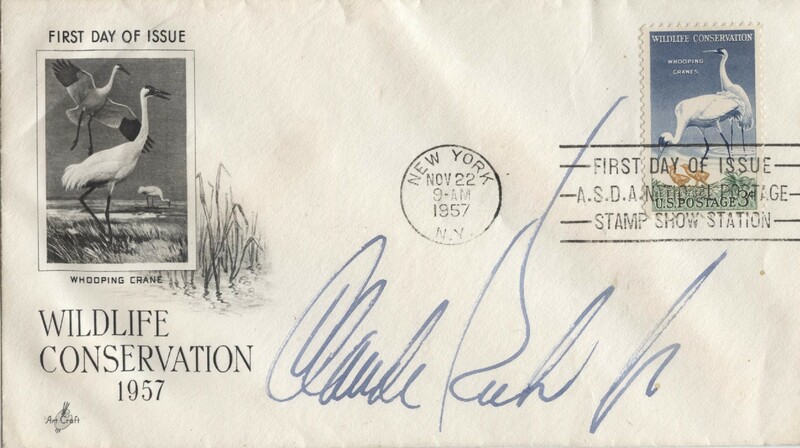 First Day of Issue Cover signed by the 36th Governor of Florida, Claude Kirk Jr.
Letter to Mr. Kmen thanking him for his energy saving idea, hydroelectric riverside turbines letter. 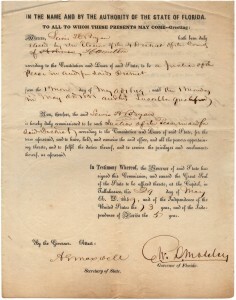 Signed by Governor Askew. 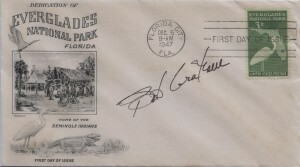 Bob Graham signed First Day of Issue Postal Cover.